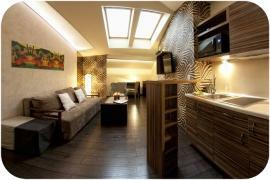 A two-bedroom apartment located in a beautiful building in the Old Town of Krakow. There is a double bed in one bedroom, and two single beds (which can be connected at your request) in the other. A lounge (with a kitchenette) can also function as a bedroom, because there is a double convertible sofa there. There is a bath tub and a washing machine in a bathroom.